Posted By:Unknown | At:12:11 AM Be the first to comment! (AP) OAKLAND, Calif. - Al Davis, the Hall of Fame owner of the Oakland Raiders known for his rebellious spirit, has died. The team announced his death at age 82 on Saturday. It was not immediately clear when and where he died. It was Davis' willingness to buck the establishment that helped turn the NFL into the establishment — the most successful sports league in American history. Davis was one of the most important figures in NFL history. That was most evident during the 1980s when he fought in court — and won — for the right to move his team from Oakland to Los Angeles. Even after he moved them back to the Bay Area in 1995, he went to court, suing for $1.2 billion to establish that he still owned the rights to the L.A. market. Davis, elected in 1992 to the Pro Football Hall of Fame, also was a trailblazer. He hired the first black head coach of the modern era — Art Shell in 1988. 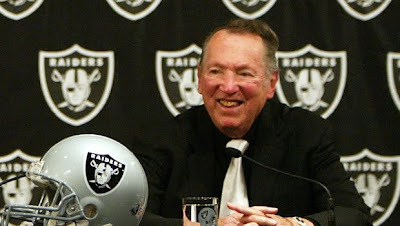 He hired the first Latino coach, Tom Flores; and the first woman CEO, Amy Trask. And he was infallibly loyal to his players and officials: to be a Raider was to be a Raider for life. But it was his rebellious spirit, that willingness to buck the establishment, that helped turn the NFL into THE establishment in sports — the most successful sports league in American history. He was the last commissioner of the American Football league and led it on personnel forays that helped force a merger that turned the expanded NFL into the colossus it remains. Born in Brockton, Mass., Davis grew up in Brooklyn and graduated from Erasmus Hall High School, a spawning ground in the two decades after World War II for a number of ambitious young people who became renowned in sports, business and entertainment. Davis was perhaps the second most famous after Barbra Streisand. Then he bought into the failing franchise, which played on a high school field adjacent to the Nimitz Freeway in Oakland and became managing general partner, a position he held until his death. But as the many bright young coaches he hired — from John Madden, Mike Shanahan and Jon Gruden to Lane Kiffin — found out, he remained the coach. He ran everything from the sidelines, often calling down with plays, or sending emissaries to the sidelines to make substitutions.